Auto shutoff battery saver - 5 minute signal inactivity. Mutes output signal when engaged. Not much to review really. It's a very affordable, quality pedal tuner in an attractive case with the kind of features desirable in one. Bypass, silent, auto sensing, auto off, battery supported, hi vis, not too big, not too small. Thanks for the review! Having a tuner pedal is always essential I think. My initial foray into guitar was in the day when you tuned by ear, either E from recall or preferably with the assistance of a my sole set of pitch pipes as reference datum for E at least. Now I have digital tuners coming out of my ears ....almost. This one, 3 D'Addario micro headstock tuners, 2 D'Addario micro soundhole tuners, a Korg line or mic sensing or manual tone pitch tuner and of course, the bevy of freebie downloadable phone app tuners from Fender, Boss etc, the digital tuner feature in my ID:Core amp, and of course even Guitar Tricks own online tuner. 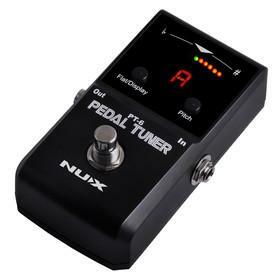 For electric players, IMV a comprehensive pedal tuner like the NUX is definitely something which should be on the 'nice tool to own' opportunity buy/gift list list. In a professional performing or band situation I'd consider it pretty much a must have on the pedalboard. Chinese manufacturing has made this kind of kit currently so affordable, provided one dares to venture past high profile established brand marketing.